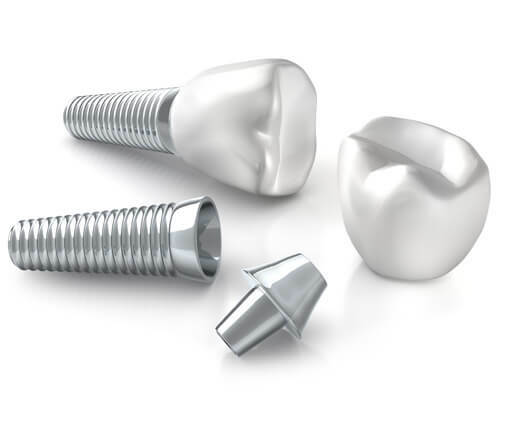 Dental implants are tiny titanium posts that are surgically placed into the jawbone where teeth are missing, acting as tooth root substitutes. The bone is able to bond with the dental implant to create a strong foundation for artificial teeth. A small post is attached to the implant, which protrudes through the gums. These posts provide stable anchors for artificial teeth. Dental implants are also a great way to help preserve facial structure by preventing bone deterioration associated with missing teeth. Missing permanent teeth can be embarrassing and frustrating when they disrupt your daily activities. At Staten Island Oral & Maxillofacial Surgery, we are proud to offer dental implants as a stable, more natural-looking way to replace missing teeth. Dental implants can be your doorway to renewed self-confidence and peace of mind. A dental implant can replace one tooth or multiple teeth to create a full, healthy smile that looks and feels natural. These replacement teeth look, feel, and function like natural teeth and allow you to eat virtually anything. What is dental implant surgery and how does it work? Your dental implant surgery will be performed by one of our highly skilled dental implant specialists and a respected restorative dentist. While our oral surgeons perform the dental implant surgery, initial tooth extractions, and bone grafting (if necessary), your restorative dentist fits and makes the permanent dental crown (prosthesis). Your restorative dentist can create any temporary dental crowns needed after your dental implant procedure. Our oral surgeons will perform dental examinations and analyze your dental history prior to your dental implant surgery. A diagnosis for dental implants is comprised of a series of X-rays, models, and the latest in 3D i-CAT imaging technology that will provide a clear picture regarding your specific condition. If you are not an ideal candidate for dental implants, techniques such as bone grafting may be recommended to prepare your jawbone to be strong enough to receive dental implants. Patients who have certain existing medical or dental conditions may not be able to receive a dental implant. If your mouth is unable to hold an implant, we’ll work with you to find a treatment that will fulfill your dental goals. What procedures are involved in getting dental implant surgery? Dental implant surgery typically requires two surgical procedures and a team effort between our oral surgeons and a restorative dentist. During the first surgery, our oral surgeons will place the implants in your jawbone. This procedure is performed in office under local anesthesia with or without general anesthesia. Throughout the next 3 to 6 months, the dental implants beneath the surface of the gums gradually bond with the jawbone through the process of osseointegration. During this time, your dentist will form new replacement teeth. Once the dental implant has bonded to the jawbone, our dental implant surgeons will uncover the implants and attach the small posts that protrude from the gums. At this time, you’ll visit your restorative dentist who will create and fit the permanent dental crown for you. The entire process generally takes anywhere from 6 to 8 months. Is there an alternative to the two-step dental implant surgery? Using the most recent advances in dental implant technology, our oral surgeons are now able to, in some cases, place dental implants in one dental implant procedure. These dental implants do not require a second procedure to uncover them but do require a minimum of 6 weeks of healing time before permanent artificial teeth can be placed. 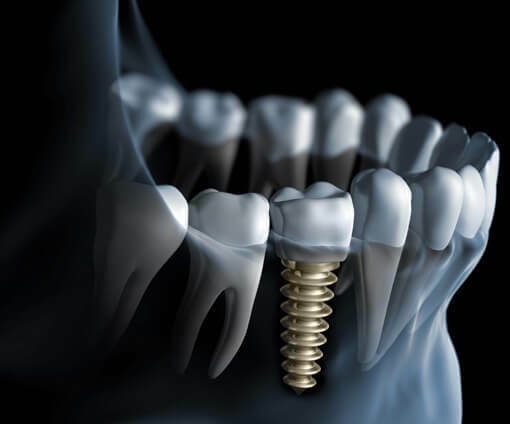 In some instances when there is sufficient stable bone surrounding the extraction site, you may be a candidate for immediately placed dental implants during your initial dental implant surgery. It may also be possible to place a crown the same day as your dental implant procedure. The dental crown is usually temporary, and once the dental implant is fully fused and integrated within the bone, the temporary crown can be removed and replaced with a permanent one. If they are well taken care of, your implants will last for many years. Proper care includes taking the time to practice good oral hygiene (brushing and flossing) and keeping regular appointments with your dentist. With proper dental hygiene, dental implants are long-lasting and will provide natural-looking results. Because dental implants are scientifically designed to act like your naturally-occurring teeth, it is important to maintain good oral hygiene to ensure the stability and health of your dental implants. A dental crown is used to replace each missing tooth or teeth. A dental crown (prosthesis) is attached to the dental implant that is securely placed in your jaw. 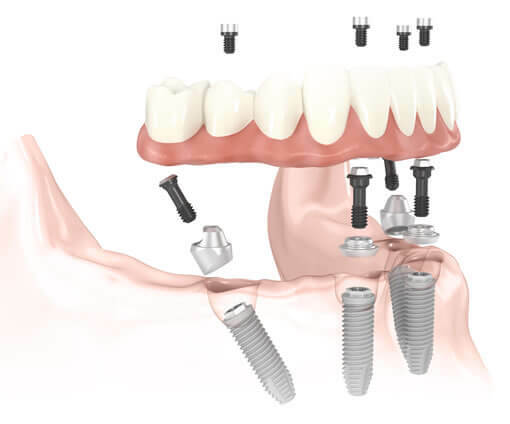 A fixed bridge, also known as a partial prosthesis, is capable of replacing two or more teeth. Fixed bridges may only require 2 or 3 dental implants. On the other hand, a complete dental prosthesis is capable of replacing all missing teeth in your lower or upper jaw. The total number of dental implants differs depending on what type of complete prosthesis is recommended for your dental implant procedure. Overdentures, also known as removable teeth or dentures, attach to a socket bar or ball. A fixed prosthesis is permanent and can only be removed by a dentist. One of the many benefits of dental implants is that they do not need additional support from neighboring teeth. 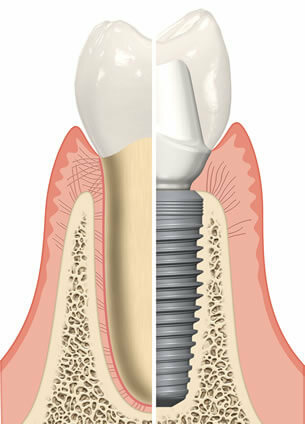 Dental implants are permanent and stable missing teeth solutions. Dental implants can help you eat, talk, and smile with confidence. With our in-office 3D Imaging System, the i-CAT provides highly accurate 3D cone beam imaging that is used to effectively determine proper dental implant placement. The 3D cone beam imaging is used to determine depth, bone density, and anatomical landmarks. Your 3D scan, along with your digital photographs, are all processed by highly experienced computer technicians to virtually plan your case in conjunction with your oral surgeon and restorative dentist in order to ensure a smooth surgery. Why should I consider Staten Island Oral Surgery for dental implant surgery? For anyone with missing or failing teeth, dental implants are a popular and effective permanent solution to replace teeth. Dental implants are designed to provide a strong foundation to replace missing teeth with dental crowns that look, feel, and function just like natural teeth. At Staten Island Oral & Maxillofacial Surgery, our board-certified oral surgeons and dental implant specialists are uniquely experienced in all aspects of dental implant surgery. Our oral surgeons place thousands of implants every year utilizing the latest technologies and the most advanced surgical techniques. When making the important decision of where to receive dental implants, trust your care to the dental implant experts at Staten Island Oral Surgery. How can I find out more about dental implant surgery? For more information on dental implant surgery, please contact Staten Island Oral & Maxillofacial Surgery to schedule an appointment with oral and maxillofacial surgeons David Hoffman, D.D.S.,F.A.C.S., Lydia J. Lam, D.D.S., Steve Yusupov, D.D.S., M.D., and Mark Stein, D.D.S., M.D. at 718.226.1251.